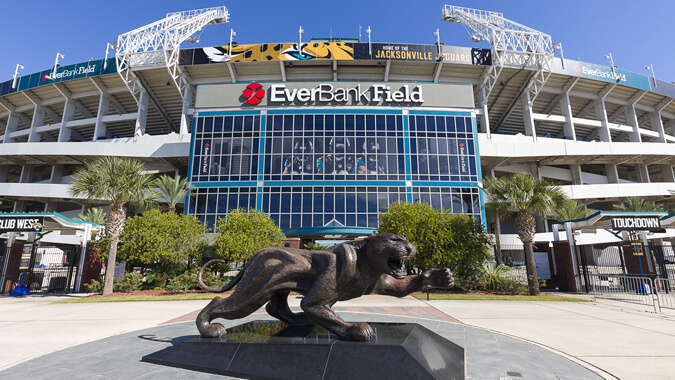 EverBank Field (originally Jacksonville Municipal Stadium and formerly Alltel Stadium) is an American football stadium in Downtown Jacksonville, Florida, and the home stadium facility of the Jacksonville Jaguars of the National Football League (NFL). The current stadium opened in 1995 on the site of the old Gator Bowl Stadium, which had been erected in 1949. Located on the St. Johns River, it sits on 10 acres (4.0 ha) of land, including portions of the older stadium. At its opening, it had a total capacity of 73,000 and expansions over the past decade have since increased that to 76,867. The stadium hosted Super Bowl XXXIX in 2005 and has also held a number of college football games as well as concerts and other events.